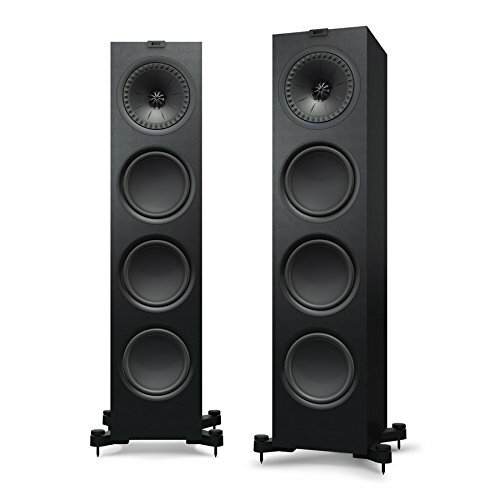 The Q900 floorstanding speakers are KEF’s flagship Q line model. They feature an all-new designed Uni-Q driver array. The Q series is cram packed with KEF’s signature designs and innovation. The Q900 features a total of four drivers. At the top of the speaker is their signature 8″ Uni-Q driver with a 1.5″ tweeter. Below this are three bottom 8″ woofers to power the mid and low range frequencies. Of the three, one 8″ driver is powered separately to allow the tower speaker to maintain a bass reflex design and cover the lows with ease. For wiring, the KEF Q900 has two sets of speaker terminals. It can be accommodate biamping or biwiring. The top terminals power the tweeters while the lower terminals connect to both the Uni-Q driver and the woofers. The Q900 is a remarkably performing speaker. Visually, the design is bulky and a bit out dated but it’s very well constructed with high grade materials. But the most important thing to consider is it’s performance. It has a great coverage of frequencies, balanced sound and is great for all types of music/sound. What stood out to us too is the price tag. It’s an incredible bang for your buck. More information on our website: http://www.avland.co.uk/aasp/kef/1020/q900/q900.asp Review of the KEF Q-900 Floorstanding Loudspeakers. Captured from my phone so I know there's a loss in quality, but I thought I'd showcase (as best as I could) the Q900's with a diversity of songs and genre's. Check out Household Audio’s list of Best Floor Standing Tower Speakers for your home.